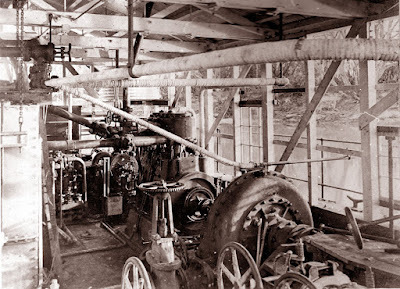 with locomotive boiler used on stopbank building. With a very wet summer and autumn season, and with Cyclone Cook having just crossed the country, flooding is understandably a very topical subject in New Zealand. 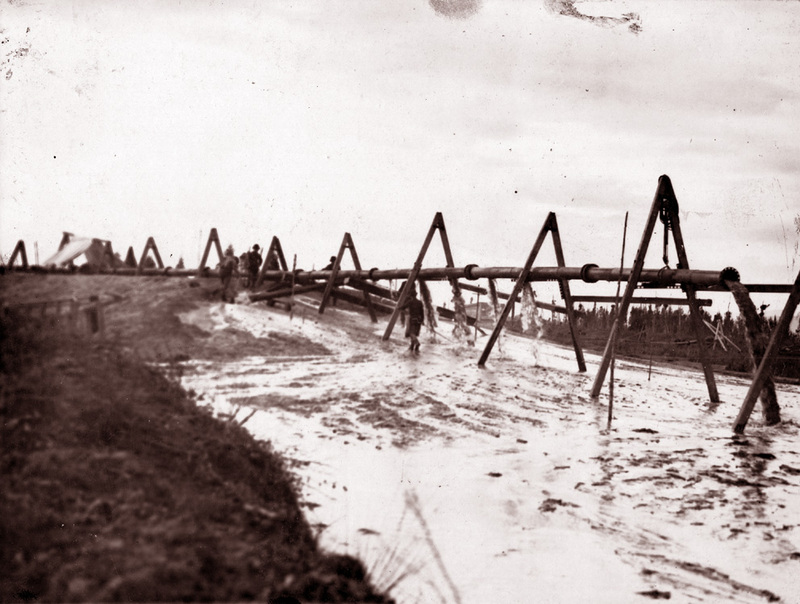 It was in the period 1911 up to 1928 that the New Zealand Government Public Works Department (PWD) spent around £1,000,000 on channel clearing, stopbanking and the installation of (I believe up to 200) floodgates on the Waihou and Ohinemuri Rivers on the Hauraki Plains of the North Island. This scheme, which was completed in 1928, was not only to control recurrent flooding but also to aid drainage of swampy low lying land so that it could be developed for agricultural purposes. Flood protection work and stopbanking was completed along the entire length of the Waihou River from near Turua to Mangaiti (near Te Aroha) and to Karangahake on the Ohinemuri River. 1½ cubic yard, 2 cubic yard heaped capacity. In 1974, Kevin Simson, the Hauraki Catchment Board Engineer, wrote that "Considerable lengths of the original stopbanks on the Waihou River are built principally of sand. Firstly, two small banks were built parallel to the centre of the final bank. These initial banks were generally only two or three feet high, and of a similar width. The material was obtained on the site using horse scoops, barrows and much hand labour to move the material. The next stage was the pumping of the sand fill from the river channel to be placed between the small toe banks which retained the material. After a period of settlement, the sand fill was trimmed... and a veneer of silty clay obtained from the river berm was spread as a top cover, being a foot to 18 inches thick. Approximately 28 miles of stop banking... were built in this manner." "After a month or six weeks I left Heddon Bush [Southland, early 1911] to have a look at the country further north, travelling by coastal passenger ship, stayed over at Timaru and Gisborne and then rejoined the ship on one of her subsequent trips north to Auckland, during my stay there, replied to an employment agency’s adverts for a man to take charge of a launch and assist with survey work. I was engaged and travelled by the well-known Paddle Steamer “Whakatore” to the Thames where I was met by a Maori who was to navigate the launch up the Lower Waihou River to the Junction, Paeroa a distance of around 25 miles and tidal all the way. We took over the launch from the owner Mr Kirby who ran a launch passenger service up the Piako River. In due course we arrived all well, found that it was the Public Works Dept. I was engaged by. 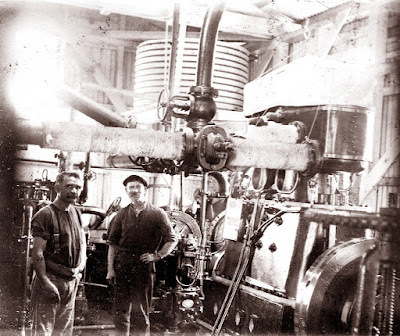 The Engineer in Charge, Mr R Young, had just arrived, I was the first of the staff to be employed, the date, May 1911, I think it was, thus started my 16 years stay at Paeroa." it digs a drainage channel through miles of rough swamp. 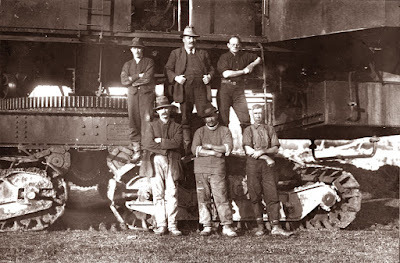 "The survey camp and office was in a fairly large farm house belonging to Mr Buchanan out the Waihi Road close to the town, it served for awhile until we moved into an old deserted Bank Building in town. Later a redundant Post Office was moved in from a worked out gold mining area near Waihi, it was enlarged once or twice to accommodate the large staff of later years. Although the office was now in town, the house was still in use by the single men of the survey, the man cook was paid by the Department, and we boarders shared expenses and lived well. Wages were 8/- per day." "As the result of damage to farm lands on the Ohinemuri & Lower Waihou Rivers by mining tailings dumped into the river by the Waihi Gold Mine, mostly from their Waikino Stamp battery, the river beds were being raised that in flood time the rivers overflowed and depositing this silt or tailings over good farm land etc. A Royal Commission sat and suggested certain remedial works & after survey of the damaged land pay compensation. Thus came into being the Waihou & Ohinemuri Improvement Scheme and entrusted to the Public Works Dept. to carry out." P.W.D. No 1 Waihou 10" Suction Dredge, built 1914.
submerged but I do hold images of them. 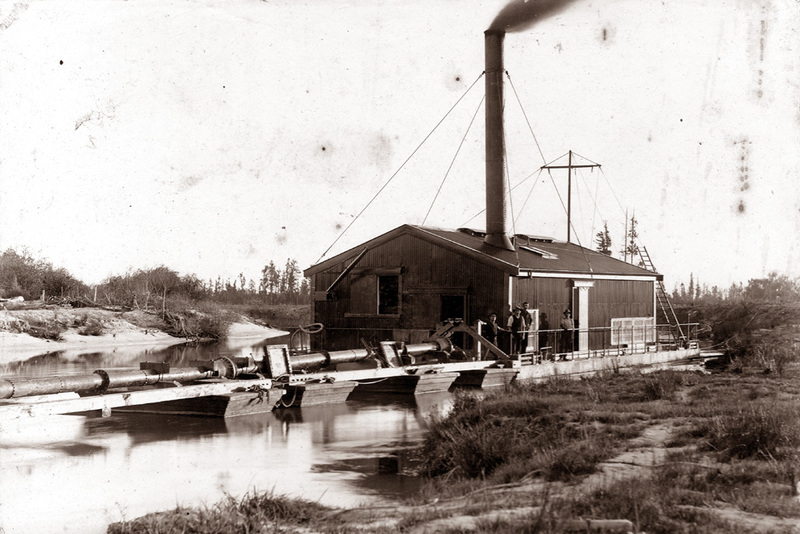 "Many miles of river stopbanks were built using wheel barrows and drays. 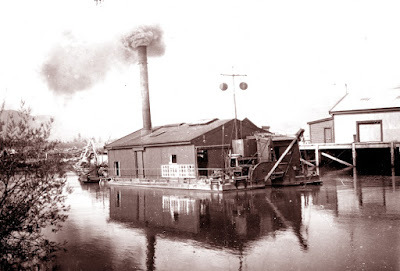 Later on when the Draglines and Suction Dredges were employed, the major work of building the larger stop banks were done, the dredges pumping spoil from the river beds for this purpose, some of the banks were 90ft wide at the bottom & 12 to 14 ft height and quite a few miles were done. Preliminary work of clearing the bases for the stop bank itself, removal of scrub, trees & roots using log haulers and hand work as well as clearing the river of willows. 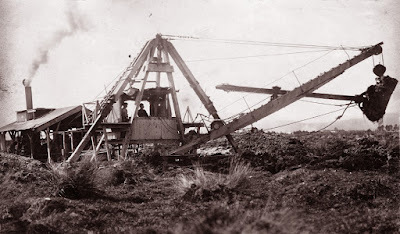 Of the Suction Dredges, No1 was 10” steam driven and was used initially for the cutting of the Ngararahi canal 63 chains long by 80 feet wide and 12 feet deep to deviate the whole upper Waihou River to shorten it’s course by some miles. At the lower end of Ngararahi cut, another cut, the Koutu, was made 10 chains long, 16 feet wide & 12 feet deep was made to carry both the Ohinemuri & Upper Waihou Rivers. This work was carried out when the First World War was in its early stages." "...I was called up for military service but at my medical examination did not pass [supposedly due to 'flat feet' so could not march], later on I realized that the Dept. had pre-arranged this considering that I was essential in the interests of the river works." "I was [initially] employed on a casual basis, later I was placed on the permanent staff of the department [and] appointed Dredgemaster and overseer then. 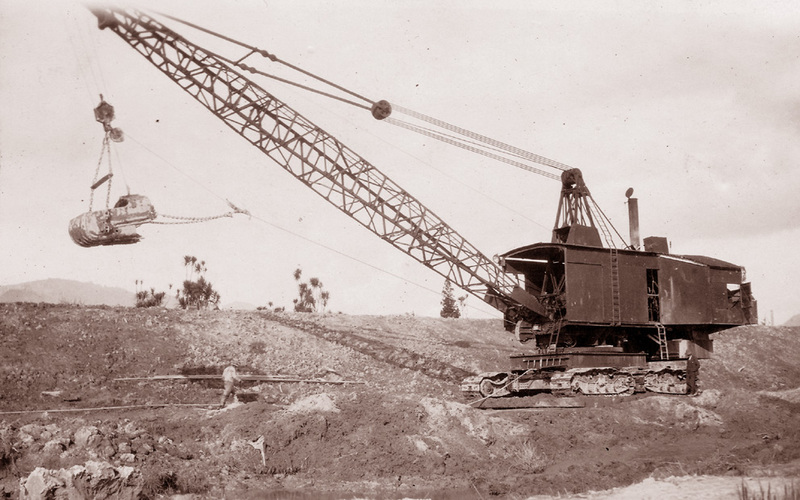 The plant during the 1920’s was extensive, 2 Ruston & Hornsby 1½ co yd draglines, steam driven on Caterpillars, each 90 tons in working order, 2 Bucyrus ¾ cu yd Draglines 30 tons each on Caterpillars, 1 Dipper Dredge 1 cu yd capacity, used for digging main drains through swamps, it dug out its own flotation, 2 log haulers 8” cylinders, dry back Horiz [sic?] 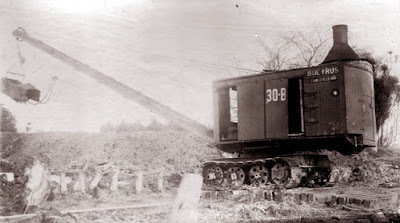 Boilers on both, a 4 ton motor lorry for coal cartage etc, 4 launches, a barge with mast & derrick to handle 5 tons operated by a winch & boiler, several service barges, one large one was used for moving the 90 ton draglines about the river." 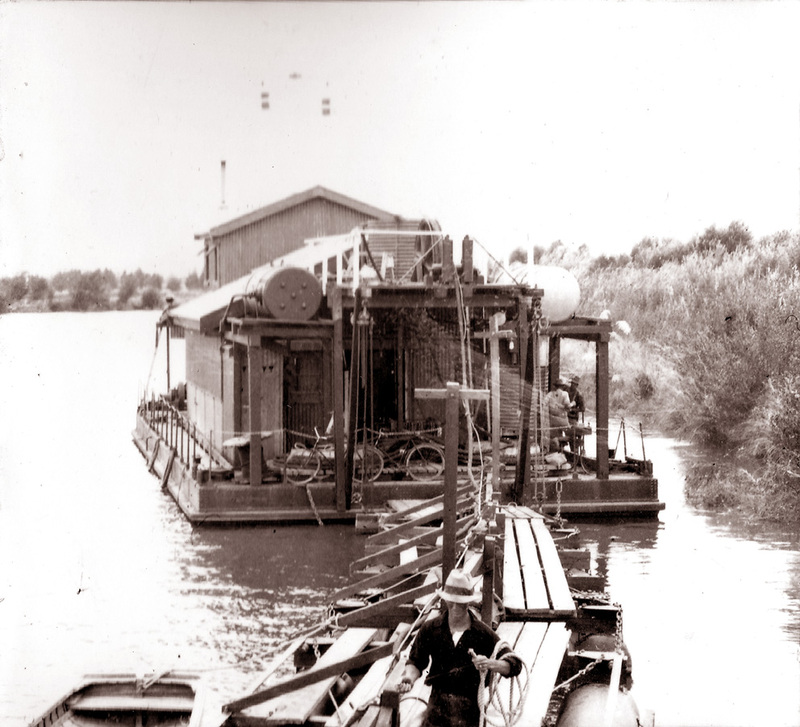 "No1 Waihou Dredge, steam driven, had a 10” gravel pump, No 2 Waihou Dredge, Electric, 250 hp variable speed 3 ph 50 cycle motor. The Steel Hull was built in the Dept’s Workshops at Tauranga and towed round to Paeroa where I superintended the installation of the machinery & electrical equipment, the Electric Power came aboard by cable at 11,000 volts to the transformer & control systems in an isolated compartment on board, the pump motor and those for the winches and rotary cutter took 440 volts 3ph. When in operation an Electrician was employed and his duties included the dismantling & re-erecting the shore powerlines as required between the dredge and the tapping point with the Power Board lines. I was responsible for the repairs and upkeep of the plant, and had a workshop at the Puke, the Public Works Department (P.W.D.) Depot, manned by Fitters, Turner & Blacksmiths full time, also for the ordering of spare parts and consumable stores, wire, rope, coal, benzene etc used on the works." "There were quite a few day men and contractors employed on concrete culvert work as well as digging and deepening ditches, handling, transporting coal to the Draglines & No 1 Dredge etc. Repairs to launches and barges were done by our own men, we also built several road bridges over rivers, Australian hardwood trusses & piles, all of which I had to do with. During the earlier years, men were employed on the Co-op contract system on the building of stopbanks by wheel barrow from barrow pits, some lived in tents or PWD huts. This work required a good deal of supervision. The number of men on the works varied greatly, an all high of nearly 100 was almost reached once, then towards the end of the war, we had nearly 100 Jugo Slavs interned with us, more or less, enemy aliens. They were put onto digging ditches and clearing willows etc and lived in a camp on the river bank at the end of Mill Road. The Police had to be informed of any leaving, several had to be repatriated, many did drift away, eventually the camp was closed down, but several stayed, and taken on to work in our gangs being good men." "At times I was delegated to inspect Post Offices & other Government buildings when small repairs were needed and arranging, after estimates etc were approved for the work to be done by contract. There were other inspections out with my duties on the Ohinemuri River Scheme. I often assisted the Chief Clerk and a timekeeper in making up and checking the pay sheets including the money for each man of an evening. I also accompanied them on pay day to recognize the men being paid etc. Over the years I travelled by launch a good deal, also a saddle horse and latterly was provided with a car [a Ford Model T]... The office staff grew from small beginnings to a Chief Clerk & Assistant, Time Keeper, Cost Clerk, several draughtsmen, Engineer’s Assistants etc." 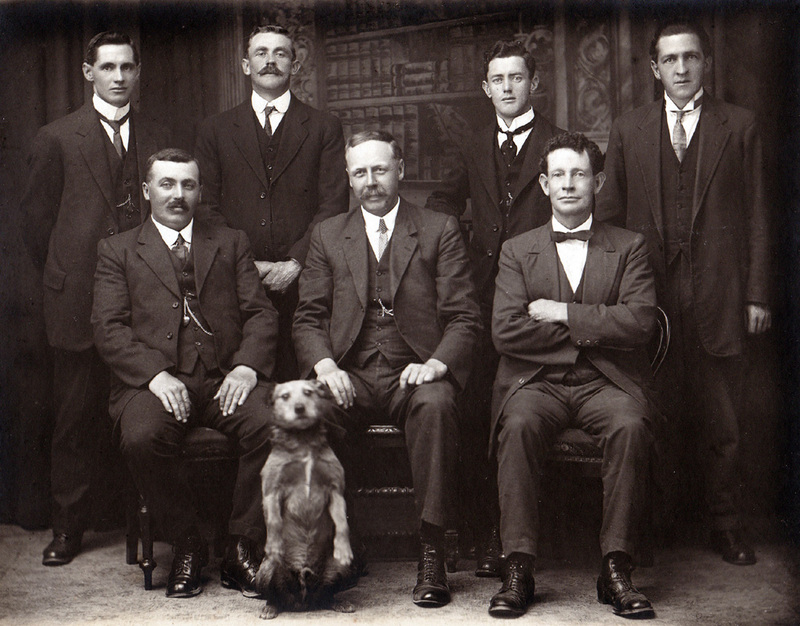 Cyril Halliday (Chief Clerk); Jack McDonald (Draughtsman). H.R. Young (P.W.D. Engineer); J. Burnside (Road Overseer). - "Ohinemuri - Exploring our Historic and Natural Heritage Literature"
Unless otherwise stated, all images are from my own personal collection and may be freely copied for non-commercial and academic use provided this site is acknowledged. Images may not be used for commercial purposes without my express written permission. 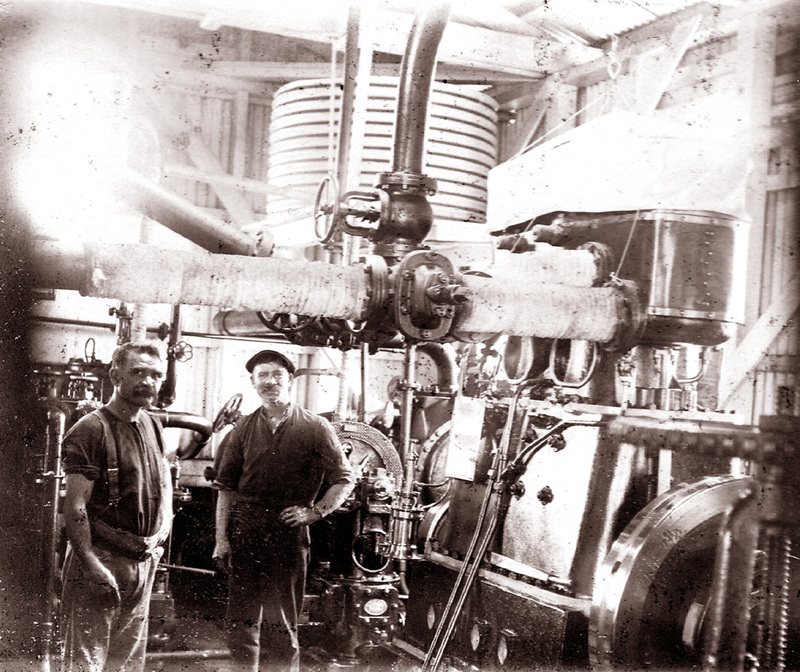 Very interesting article, Paeroa Historical Maritime Park and Museum would like to see any more photos etc you have to add to our information and knowlege. The Prohibition Era and the Illicit Supply of "Hokonui Moonshine"
Ex Banker and Photographic Archivist into walking, antiques and collectables, railways and vintage transport, history, culture, genealogy and historical blog writing. My Blogs are primarily inspired by objects or images in my own personal collections. My Blog title "The Lothians" is taken from the name my Grandfather gave to his 459 acre estate in Central Southland.